For editors, new software tool — and Connell, too? Gannett is on the verge of launching an online software application to make it easier for its newspapers to share and reuse each others’ stories and other content, readers tell me. The service, possibly called Gannett One or Content One, could largely or completely replace what remains of Gannett News Service. What’s more, it appears to be a step in the direction of weaning the company off increasingly expensive Associated Press stories, video and other content. CEO Craig Dubow and Gannett’s chief spokeswoman Tara Connell described the new initiative in a series of employee meetings yesterday during a Corporate tour of papers at Greenville, S.C., and at Brevard and Fort Myers in Florida, readers say. “There was a TON of open groaning and shifting about this from the news side of yesterday’s meeting,” one tipster told me about the News-Press meeting in Fort Myers. Gannett One would let an editor quickly determine which company newspapers have just published a spring gardening story on, say, planting tulips. The story could then be downloaded, re-written to include more local information, then published online and in print, readers say. An employee since 1972(!!! ), Connell has spent the past five-plus years in the public-relations spin cycle, defending Dubow and other top executives even as their compensation skyrocketed while revenue and the company’s stock price tanked. Calling Brevard, other staff: What’s Dubow saying? Gannett CEO Craig Dubow is reportedly on the road again this week, visiting Florida Today this morning/afternoon before (I believe) hitting The Greenville News in South Carolina, and The News-Press at Fort Myers, Fla. So, what’s he saying during employee meetings? Updated at 7:23 p.m. Oct. 17, the day of the purported sale announcement. Nothing yet on the paper’s website about a new owner. The Daytona paper has been on the sale block since April, when the majority owning Davidson family was forced to find a buyer after losing a costly court challenge brought by minority owner Cox Enterprises. Last spring, two readers here wondered if Gannett might be interested; yesterday’s e-mail, plus an anonymous comment from a second reader, was the first I’d heard about GCI’s possible interest in the paper since May. It would be noteworthy if Gannett was shopping again. There’s been little market for print papers in some time: values plunged amid increased uncertainty over the industry’s prospects, and the broader economy’s further weakening. Three months ago, for example, Dow Jones & Co. shelved plans to sell its smaller Ottaway Newspapers chain. Buyers fear getting burned by paying too high — which is what happened when private investor groups scooped up the Minneapolis Star Tribune and the The Philadelphia Inquirer at the wrong time. But Gannett may be a uniquely well-placed suitor for Daytona because it already owns Florida Today, 90 miles south in Brevard County’s Melbourne. GCI could boost profits by eliminating duplicate jobs at the papers, in human resources, accounting, production and editorial. The papers could share printing. And a single publisher and editor could oversee both titles — Gannett’s direction, with its clustering strategy. Of course, GCI already has its hands full in Florida, the source of so much revenue loss because of the battered real estate market. But that could force the Davidsons to sell at a really bargain price. The News-Journal says it is Florida’s last family owned paper; the Davidsons have controlled it since 1928. Daytona, Brevard staffers: What have you heard? Please post your replies in the comments section, below. To e-mail confidentially, write gannettblog[at]gmail[dot-com]; see Tipsters Anonymous Policy in the green sidebar, upper right. Related: A blog devoted to the Daytona paper, although it looks like it’s on hiatus. Updated at 4:25 p.m. ET. 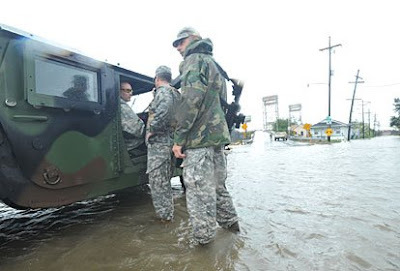 Gannett employees from Louisiana and Mississippi, fortified by teams from Florida, Des Moines, USA Today and elsewhere, are covering Hurricane Gustav‘s landfall today, publishing videos and other news reports live and real-time. 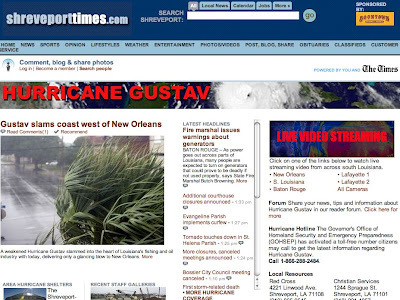 As millions fled inland, The Times in Shreveport, La., and other sites streamed live storm video. Do you know co-workers there? Wish them well! Please post your notes in the comments section, below. To e-mail confidentially, write gannettblog[at]gmail[dot-com]; see Tipsters Anonymous Policy in the green sidebar, upper right. Andrews joined Gannett in 1979, as a staff writer at what’s now Florida Today at Cocoa, Fla. In a mid-afternoon memo, top editor Paul Anger said Andrews would continue with all the duties and responsibilities of executive editor until that date. The memo continues: “Caesar told me at the beginning of his outstanding tenure here that for years he had considered making a career change, and there could come a time when he would decide to do something else besides editing. I had hoped that time would never come, and we’ve delayed making this announcement in the hope that he might change his mind or that another challenge could be found in the company. “By the time I depart in early November, I intend to have expressed my personal gratitude to the many people who made my three years in Detroit as fulfilling as just about any stage in my career. Long-time Florida Today Managing Editor Bob Stover (left) was named the paper’s top editor today. He replaces Terry Eberle — who recently took the top newsroom post at The News-Press in Fort Myers, Fla. Today says Stover has worked for Gannett since the mid-1970s, although I thought he joined the company with GCI’s purchase of the now-shuttered Arkansas Gazette in 1986.
Who will replace ‘class act’ Eberle at Brevard? Florida Today‘s next editor will have a tough act to follow, based on the comments I’ve read about Terry Eberle, the newly appointed top editor at The News-Press in Fort Myers, Fla.
Eberle will now lead the newsroom of a somewhat larger paper: The News-Press‘ daily circulation is about 84,000 vs. 79,000 at Brevard. Sundays, it’s about 101,000 vs. 95,000. I don’t know the cast of possible Eberle successors at Today or at other Gannett papers. Anyone want to take some guesses? Employees aren’t the only ones who’ve lauded Eberle’s work, of course. He tied for editor of the year in the 2006 Best of Gannett awards. Judges noted the speed with which Today switched to the then-new Information Center model. “In a year of extensive transition, Terry provided outstanding leadership. . . . It was a remarkable job,” their citation said. He’s bound for another Florida paper that grew in stature within Gannett for its early work on the Information Center model. Under the editor Eberle replaces — Kate Marymont, now in Corporate’s News Department — the News-Press became the public face of GCI’s efforts to merge online and print news gathering: The Washington Post featured the paper in a fairly glowing page-one story, in December 2006. Related: Eberle’s November News Watch article on how new technologies are shaping decisions by editors to publish once-verboten stories — like news about bomb threats at public schools. Updated at 7:05 a.m. ET, July 3: Who will replace ‘class act’ Eberle at Brevard? Brevard staffers: What can you tell Fort Myers about Eberle? Post your replies in the comments section, below. To e-mail confidentially, use this link from a non-work computer; see Tipsters Anonymous Policy in the green sidebar, upper right. You are currently browsing the archives for the Brevard category.